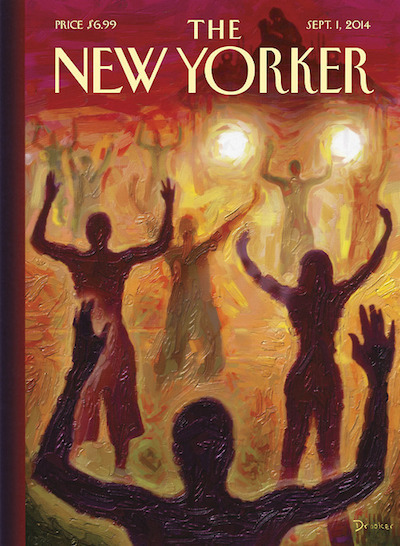 The New Yorker is the latest magazine to publish a moving cover dedicated to the Michael Brown shooting — and the aftermath — in Ferguson, Missouri. As a resident of Manhattan’s Lower East Side, I witnessed the blurring distinctions between the police and military during the Tompkins Square riots of the eighties. I’ll never forget the day the N.Y.P.D. showed up in a military tank to evict nonviolent squatter friends from buildings on Avenue B and Thirteenth Street, where I grew up. This incident triggered a vivid childhood memory of the police driving a similar armored tank on East Fourteenth street, in 1968, to quell possible ‘disturbances’ after Martin Luther King was assassinated.